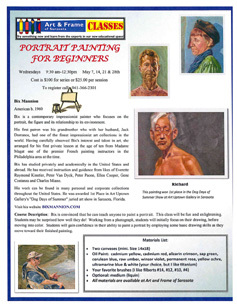 Course Description: Bix is convinced that he can teach anyone to paint a portrait. This class will be fun and enlightening. Student may be surprised how well they do! Working from photograph, students will initially focus on their drawing, before moving into color,. Students will gain confidence in their ability to paint a portrait by employing some basic drawing skill as they move toward their finished painting. Bix is a contemporary impressionist painter who focuses on the portrait, the figure and its relationship to its environment. Bix has studied privately and academically in the United States and abroad. He has received instruction and guidance from likes of Everett Raymond Kinstler, Peter Van Dyck, Peter Paone, Ellen Cooper, and many more. His work can be found in many personal and corporate collections throughout the United States. He was awarded 1st Place in Art Uptown Gallery’s Dog Days of Summer" juried art show in Sarasota, Florida.